This is, yet again, another roll from Mobo Sushi. This is a vegetarian roll, although not vegan because of the cream cheese. 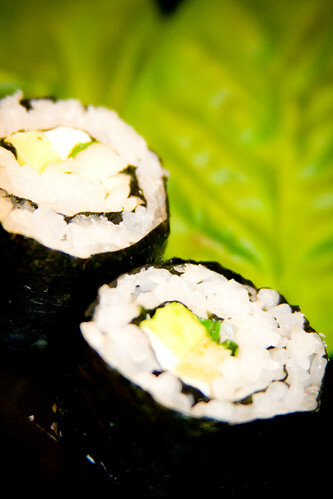 On my own, I would have never thought to put nuts or raw garlic in a sushi roll… but turns out it works pretty well! Son liked this roll a lot. I think his parents use basil a lot in their cooking, and he has a lot of food memories using basil when he was a child in Vietnam, so it brings back a sense of nostalgia. Peel the cloves of garlic, slice each clove thinly. 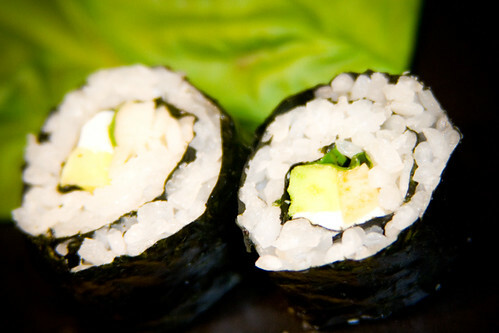 Roll the sushi, using avocado, cream cheese, half of a clove of garlic, 5 basil leaves, and half an ounce of macadamia nuts as your fillings. Hi! Just a suggestion, but can you take a picture of your rolls before they are rolled to see the placement of ingredients you use? I just thought it might be a good idea! As far as which order the ingredients should go on. I don’t think it really matters. As my dad used to say it all gets mixed together in the end. Wow, your site is awesome…I plan to visit often so I can finally get myself into making sushi. My husband’s favorite and I’ve never made it for him. o_0 I had no idea!!! Oops… I looked it up right when I read your comment, and now I’m super embarrassed. Time to change that! !